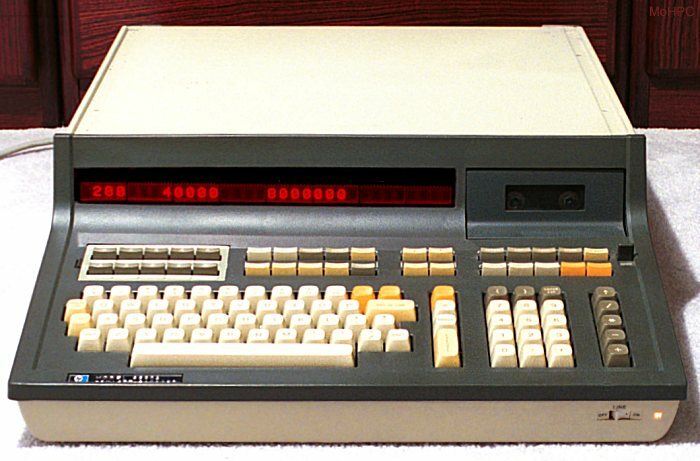 The HP 9830A was the most powerful model of the original 9800 series calculators. 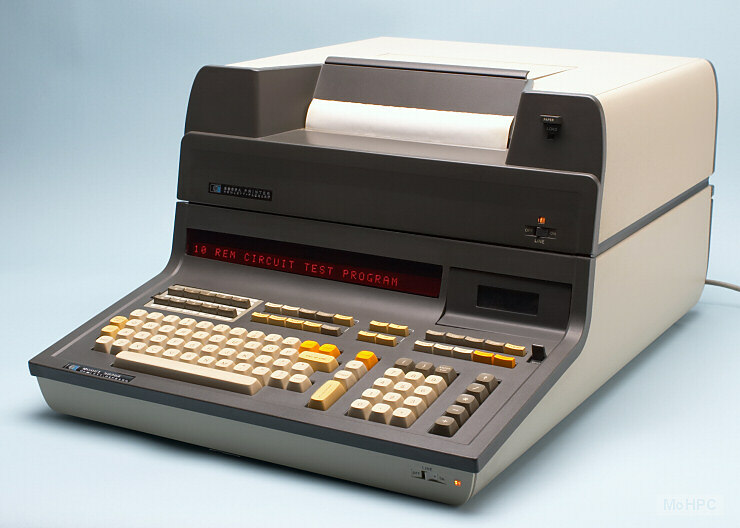 It greatly blurred the lines between traditional computers and calculators due in part to its use of the BASIC programming language and options such as terminal emulation and a hard disk drive. Even though it was programmed in basic, the HP-9830 could be used like a normal algebraic calculator. An expression was entered and the Execute key was pressed. Expressions were like those of the BASIC language with precedence and parentheses but no implied multiply like the HP 9820A. The Result key could be used to fetch the previous answer into the current calculation. The Recall key fetched the previous expression itself so it could be inspected or edited. The user had full access to the BASIC variables - even arrays - while doing manual calculations. The full complement of functions, comparisons etc. was also available. The HP 9830A contained an extended BASIC language interpreter. Extensions included extensive output formatting options, tape controls a choice of degrees, radians or grads for trigonometric functions, a wait statement and multi-line user defined functions. Matrix Operations: Provided matrix addition, subtraction, copying, multiplication of matrices by other matrices or scalars, transposition, inversion, determinants etc. Also also added a REDIMension command. 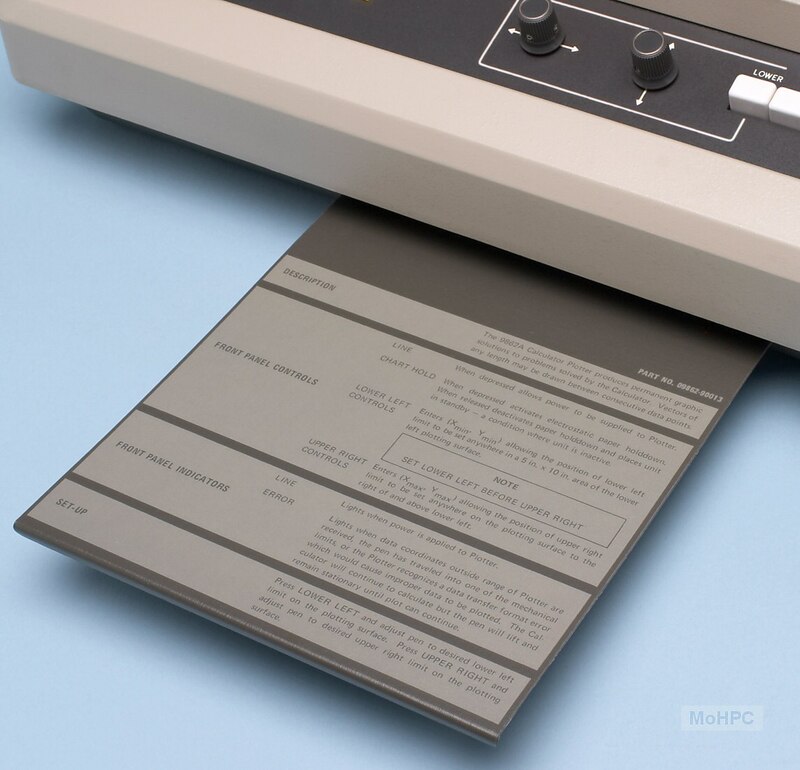 Plotter: Provided statements to control the optional plotter. Functions included setting scales, units and origin setting, axis drawing, plotting by absolute or relative addresses and text printing. 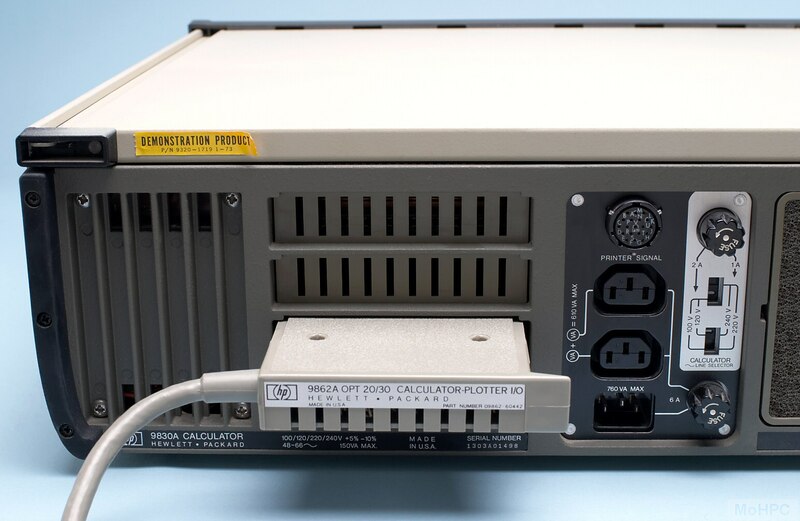 Extended I/O: Provided additional statements to allow the calculator to access data from a wide variety of devices including card readers, tape readers, voltmeters, digitizers etc. The ROM allowed user-defined translations to/from ASCII. String Variables: Provided substrings, string length, position of a substring in a string, string to number etc. The calculator had the a great deal of memory for its time. It came with 15K bytes of ROM that could be expanded to 31K by plug-in modules and 3520 bytes of available Read/Write memory that could be expanded 7616 bytes. 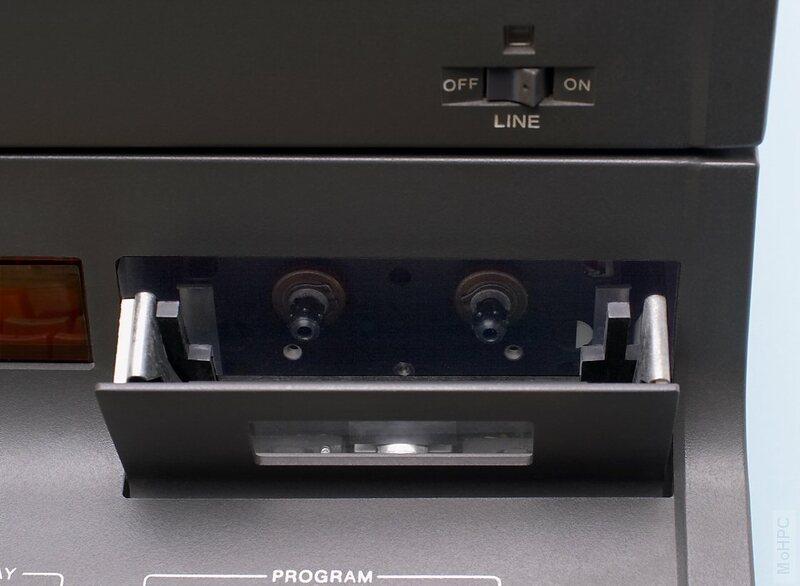 It used a built-in cassette tape drive to store programs. Up to 5 ROMs could be plugged in behind the display on the left side of the machine. 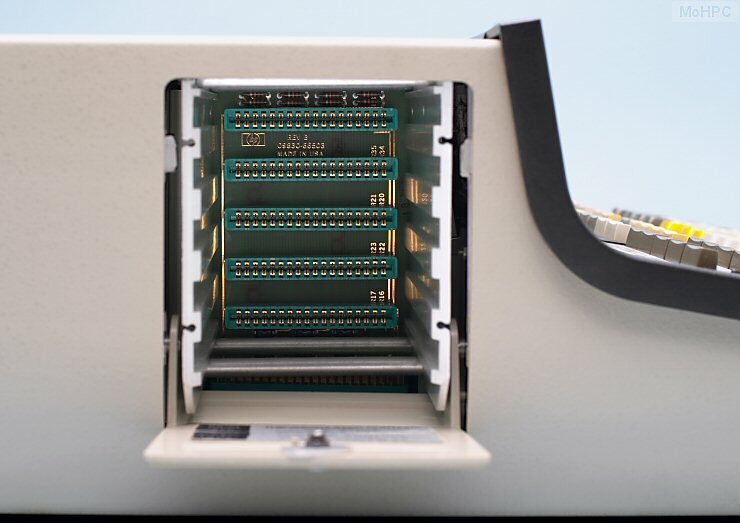 Four additional slots in the back accepted the same option cards used in the HP 9810A and HP 9820A calculators. Perhaps the most exciting expansion option were the HP9880A/B hard disk drives. These drives stored 2.4 megabytes per 14" platter. (The A model had one platter and the B model had 2.) 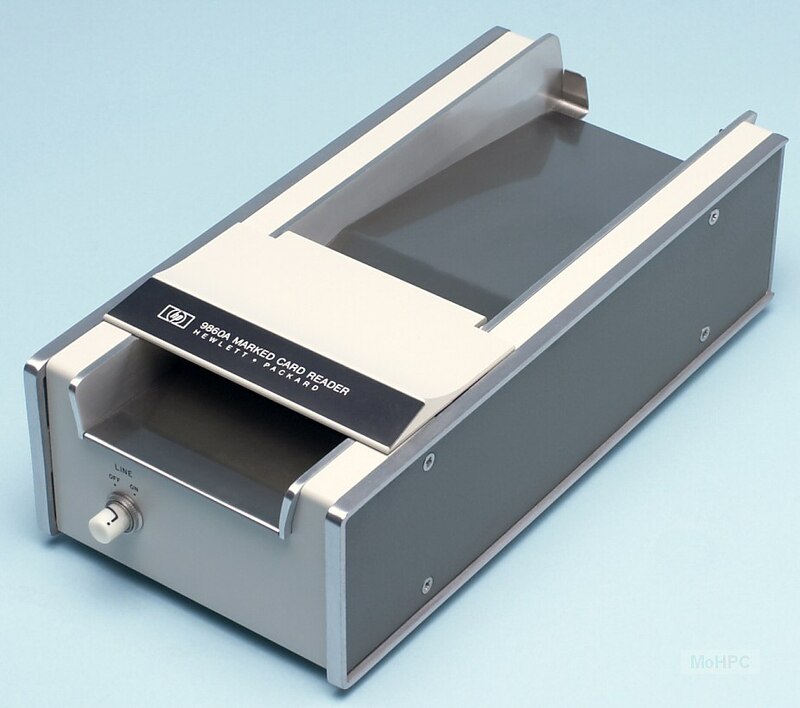 The caching disk controller was very flexible allowing up to 4 disks and 4 calculators to be attached to a single controller. A ROM module provided additional BASIC commands for using the disks. Besides the obvious commands, the ROM allowed the user to "chain" to a program on disk keeping the variables from the original program, copy cassette tapes to disk, get/save key definitions from/to disk files, read/write matrices from/to disk, password protect files etc. The exterior design was similar to the HP 9810A and HP 9820A. 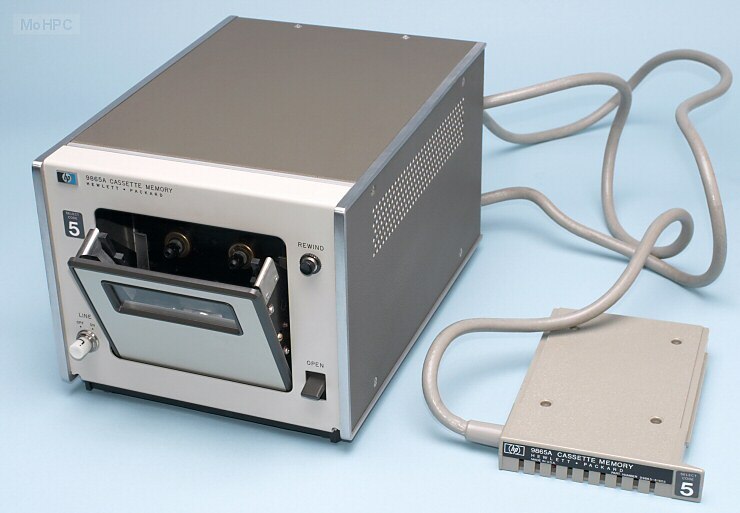 However where the other two models had a slot for inserting magnetic cards, this model housed a cassette tape drive. 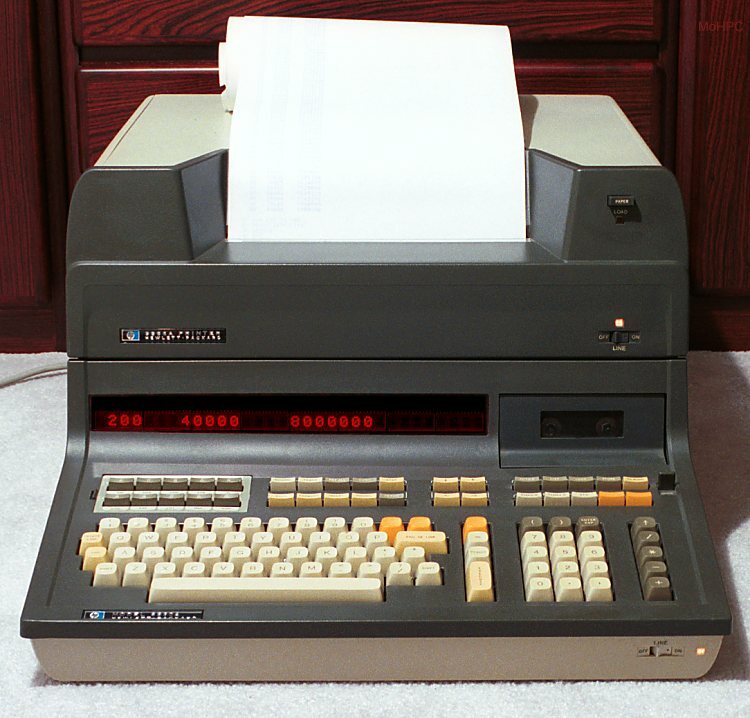 Its 32 character alphanumeric display was twice as long as the one used on the HP 9820A. (The display scrolled to allow lines up to 80 characters long.) This model omitted the 16 column built-in printer under the assumption that BASIC programmers would probably prefer the 80 column external printer anyway. The other major physical difference was the HP 9830As QWERTY keyboard. Most commands were entered by name as on a computer. In addition to the QWERTY keyboard, there were 10 user-defined keys with user-labeled overlays, 10 editing keys, 4 cursor keys, and 10 more special purpose keys for loading and storing programs etc. Like many computer keyboards of the time, End of Line and Execute functions had separate keys. 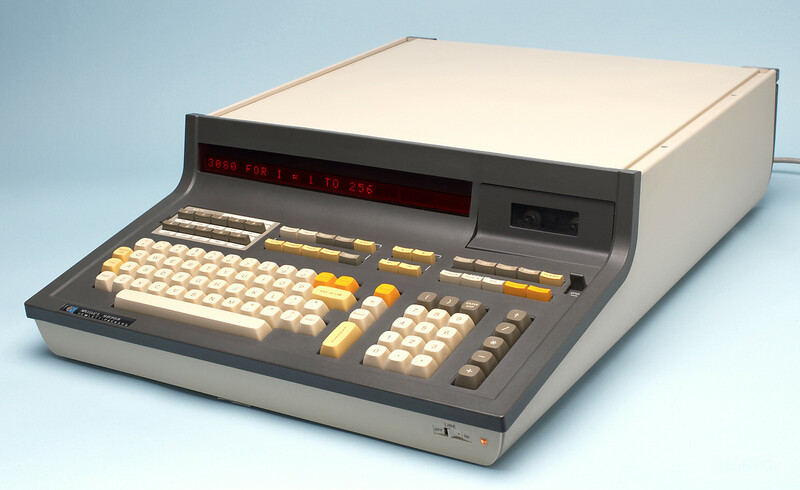 There was also a numeric keypad with keys dedicated to the basic math functions. Close up on the HP 9830A ROM area, behind the display on the left side. 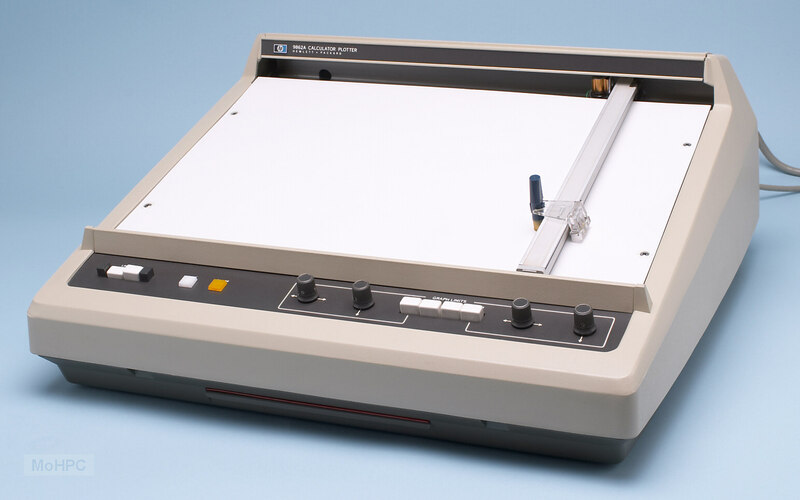 Back of the HP 9830A with a plotter module plugged into one of the slots. 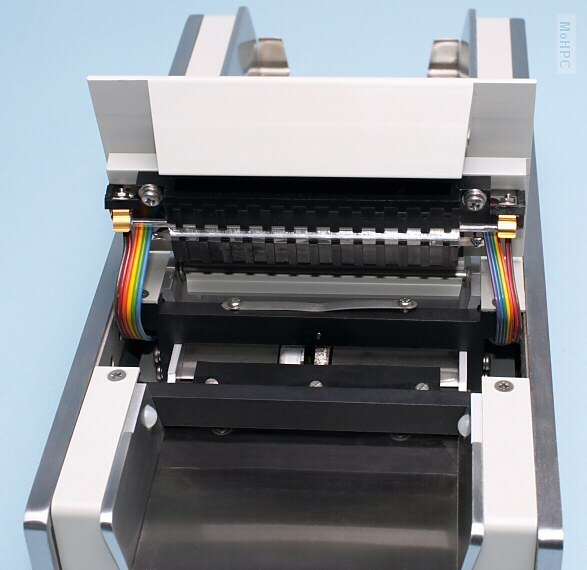 Close up on the HP 9862A plotter quick reference page. Most 98xx products had slide-out quick reference pages like this one. 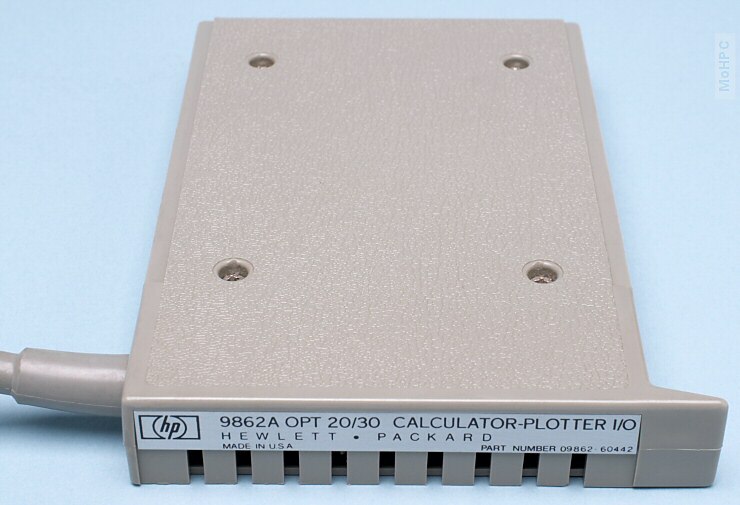 HP 9862A plotter module Opt 20/30. This could be plugged into the back of a 9820 or 9830 to interface to a plotter. Many HP 9800 peripherals were also available.